Aldea Thai is one of Playa del Carmen’s most desirable luxury beach-front condo-hotels. Its Balinese décor and luxurious ambience guarantees it´s guests a memorable Playa del Carmen stay. 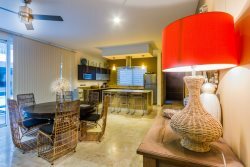 This unique property is ideally located on Calle 28 North, just meters from the turquoise blue waters of the Caribbean Sea, neighboring Mamitas Beach and Kool Beach Clubs which are incidentally, the home of Playa del Carmen´s International Jazz Festival held annually. Our two bedroom vacation home has been decorated tastefully using contemporary furnishings with Asian touches and luxury finishes. Key features include a large private terrace with plunge pool, ocean views, Plasma screens, cable service with over 50+ channels in several languages, CD/ DVD players, Keyless entry, zoned A/C system, premium appliances, luxury amenities, safe box, iron, ironing board, hair dryer, and vanity mirror all inclusive. Our services at Aldea Thai also include a personalized welcome, maid services, and grocery set-up services should you request. Additionally, the hotel features a spectacular pool with side beverage bar, direct ocean views, exterior water feature, private underground parking, complex WiFi and concierge services. Feel the magic of the Riviera Maya at Aldea Thai. Nos la pasamos excelente el servicio del staff de Vimex es magnifico seguro regresamos. Cancellations and refunds: If cancelled 60 days prior to arrival, you will get a 100% refund (minus $200 USD handling fee). If cancelled 30 days prior to arrival, you get a 50% refund (minus $200 USD handling fee). No refunds will be given for cancellations within 30 days of arrival.